You can interpret any two cards as a pair, even if their meanings are not clearly opposites. There is so much meaning in every card that useful comparisons can almost always be made. Occasional pairs arise by chance, and their relationship lasts for only that one instance. 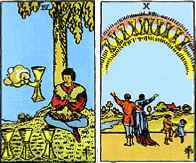 The Four of Cups shows a solitary man sitting under a tree. The Ten of Cups shows a happy family celebrating together. If the idea were meaningful to you, you might see these two cards as defining the opposites of "being alone" vs "being with others." This understanding might occur to you out of the blue as a possibility. Two cards do not have to oppose each other to form a pair. They can reinforce each other. 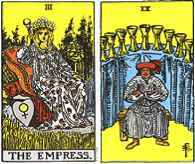 Both the Empress and the Nine of Cups suggest pleasure, sensuality and physical enjoyment. Reinforcing pairs show that a certain energy is or could be having an extra impact. Sometimes we have to face circumstances in an unbalanced way for the moment in order to achieve our goals. Balance issues are everywhere. 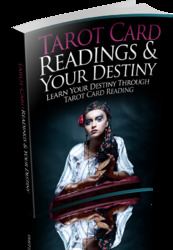 Your tarot readings can help you identify them through the action of card pairs. 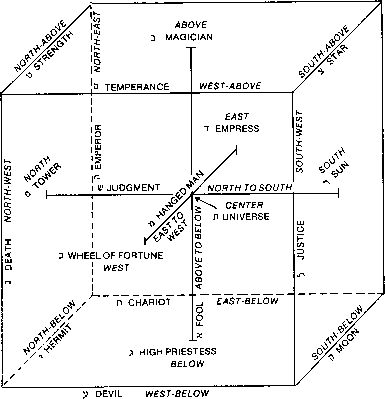 In the next lesson, we will see how these pairs operate in the Celtic Cross.